We offer legally-obtained furs, such as beaver, otter, and black bear. All our furs are professionally tanned. 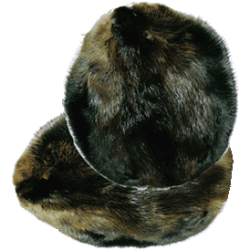 The lower range price for a pelt is either a smaller fur or one of lesser quality. Choose the amount you want to spend when you call us to order. Store furs in cedar when not being used and they will last many years. When using fur for craft work, always cut and sew from the skin side.